Will Banning Plastic Bags Help The Environment? The banning of plastic bags may not be the salvation of the environment, but it could be a useful way to begin reducing waste pollution. - is the product for which the market can best withstand a relatively high increase in the cost of raw materials, due to their low unit price. A vote of the Italian Parliament at the end of December 2010 rejected the attempt to once again postpone Article 1 of Law 296 (paragraphs 1129 and 1130) of 27 December 2006 from coming into effect, which provided the Italy-wide ban of non biodegradable single-use plastic shopping bags (hereafter referred to as "plastic bags"). Therefore, from 1 January 2011, the marketing of plastic bags in Italy is strictly forbidden: in the coming days shops and supermarkets will only be able to provide customers with the plastic bags remaining in their stockrooms, giving them to customers free of charge; and only until 31 August 2011 in supermarkets and 31 December in smaller shops. 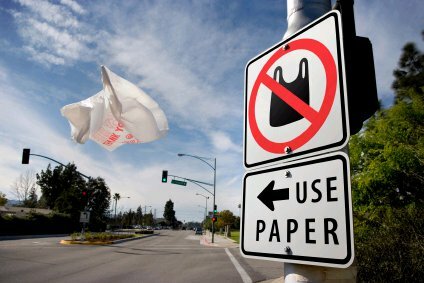 From the information I have gathered on the web, I have noticed that in the U.S.A. no state has passed laws as strict as this, although ordinances of the prohibition of, or of fiscal penalisation for, plastic bags have been enforced in some cities. The municipal government of San Francisco, in 2007, issued an ordinance ban of plastic bags in supermarkets and pharmacies with annual sales of over two million dollars, and similar decrees have been promulgated in Los Angeles County, Portland, Oakland, Malibu, San Jose, Manhattan Beach, and Brownsville, among other locations. My question is: Is the ban on the use of plastic bags a "political placebo", to quote Hank Campbell, i.e. a useless law passed by politicians as a demagogic pretence, or is it a positive measure which will insome way reduce environmental and sea pollution? I have read that many U.S. ecological associations (the Algalite Marine Research Foundation, the Californian Ocean Protection Council, the Sierra Club, and so on), state that 60% - 80% of sea pollution is produced by plastic materials, of which 90% is floating pollution; they affirm that the Pacific Trash Vortex, also known as the Great Pacific Garbage Patch, is especially composed of plastic, with at least 700,000 km², and possibly more than 10 million km², containing a total amount (taking into consideration only plastic) of many millions of tons of plastic waste. The National Oceanic and Atmospheric Administration (NOAA) of the U.S. Department of Commerce, in its thematic website on marine debris, has published a section entitled “De-mystifying the Great Pacific Garbage Patch",devoted to toning down excessive or indefinite news about this case. In “Demystifying”, the NOAA denies the existence of a "plastic island” in the Pacific, and therefore denies the possibility of defining the exact extent of waste, but states that the ocean currents produce a large spiral in the Pacific that gathers enormous amounts of waste into the “North Pacific Sub Tropical Convergence Zone", mostly composed of plastic waste, which produces myriads of microplastic particles as part of their degradation. Even the United Nations Environmental Programme (UNEP), in their article Action Urged to Avoid Deep Trouble in the Deep Seas of June 2006, states that “in the Central Pacific there are up to 6 pounds of marine litter to every pound of plankton”, and, referring to the surface ofthe sea, that "over 46,000 pieces of plastic litter are floating on every square mile of ocean today"
These estimates of the prevalence of plastic wastes over the total floating waste on the sea seem to be consistent with the Final Program Report of the National Marine Debris Monitoring Program (NMDMP) presented by the Ocean Conservancy, from the U.S. Environmental Protection Agency (EPA) Office of Water in September 2007. From the summary on page 49 about the types of waste collected between 2001 and 2006 on the coasts of the USA, I calculated that in a total of 238,103 items - between 70% and 80% - were plastic. However the fact that plastic bags are one of the leading solid materials polluting the seas does not seem to have been proven, and I have not found any studies that indicate exact percentages of the amount that the various types of waste contribute to pollution. Nevertheless, I think - at least among the solid floating waste that is gathering in the oceans - that those generated in land activities are more numerous than those produced by marine activities (fishing, goods and passenger transport, military navigation and yachting). I have confirmation of this from the report "Marine Litter: A Global Challenge" of April 2009, from UNEP. On page 196, in the final review of data on debris collected in the period from 1989 to 2007 by the annual campaign to clean coasts worldwide, called the International Coastal Cleanup (ICC), where it is declared "the dominant sources of debris emanating from land-based sources and activities, globally." By the examination of the types of waste land-based sources, I am convinced that waste from plastic packaging is the most important component, due to both their number and their shorter lifecycle. The statistics published on the Plasticseurope website, the portal of the European association of plastics manufacturers of Brussels, Belgium, indicate a global consumption of plastic materials of 245 million tons in 2010 (including thermoplastics, polyurethanes, thermosettings, elastomers, adhesives, coatings, sealants and polypropylene fibres, PET polyethylene fibres, PA polyamides and polyacrylics), and specify that the highest percentage of these plastics is destined for packaging (37%), which would consequently reach a total annual consumption of more than 94,000,000 tons. 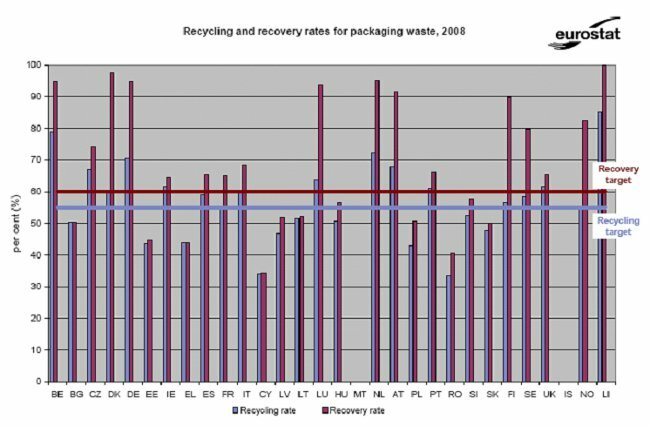 The above mentioned data seems compatible with the statistics processed by Eurostat, the European Environmental Agency, which calculates that for the 30 member countries of the European Community, 15,000,000 tons of plastic packing waste is produced for 502,737,000 inhabitants, and for Italy alone (in 2008), 2,200,000 tons was generated for 59,619,000 inhabitants. It is a matter of huge numbers, and the percentage of plastic packaging that avoids collection and recycling systems is still high, which highlights the great contribution of these materials to global pollution: in Europe, 6,200,000 tons every year are neither recycled nor disposed of! Even in Italy, 850,000 tons each year are neither recycled nor disposed of! It is sobering to see that in a continent which has a highly developed culture of environmental protection, more than 41% of plastic packaging waste is still dumped! In the category of plastic packaging waste, plastic bags are certainly an important component, if not in their weight, at least in their number. The U.S. International Trade Commission published its own investigation in May 2009 on imports of "Polyethylene Retail Carrier Bags" (hereafter referred to as "PRCBs"), which represents the most common typology of plastic bag; they certify that about 100 billion PRCBs are sold in the U.S. per year (102 billion in 2008). Many Italian environmental associations (WWF, Legambiente, etc..) state on their websites that they estimate a national annual consumption of 20 - 25 billion plastic bags (called "shoppers" in Italy), against a total European figure of 100 billion, and a total world figure of between 500 and 1000 billion. The figure of Italian consumption is consistent with the statements that I found from the Rubber and Plastics Federation, the association of Italian manufacturers, which indicate a production of about 260,000 tons of plastic bags in 2009, against 220,000 tons in 2006. Dividing the volume of the total production in Italy by the unit weight of the bags, which, in most formats used, range from 8.5 grams to 15 grams, it obtained afigure of 17 - 30 billion units/year consumed in 2008, which is in line with the estimates above. - they have avery low individual weight, and therefore a low caloric value and a low recovery value of raw material, and are therefore worth too little money to be of interest to companies that recycle plastic. I have found confirmation of the low rate of the recycling of plastic bags in "Plastic waste in the environment - final report” by the General Environment Directorate of the European Commission of October 2010. On page 79 it publishes an estimate of the collection rates of the various types of plastic packaging, where you can see that the rate of collection of plastic bags is the lowest (5%), while industrial packaging reaches up to 100% of the collection of HDPE boxes, because "[...] They are mainly used in the industrial and commercial sectors, where the recoverypaths are better established." I do not believe that 95% of all plastic bags are entirely dispersed in the environment, because many “not-collected” plastic bags are reused to pack up household waste, so they are disposed in the trash containers of municipal collection systems. However, the Final Report of European Commission may reinforce the suspicion that many plastic bags are dispersed in the environment. These, thanks to their low weight and small size, are inevitably conveyed to the sea by rain, drains and rivers, and, having a very slow rate of degradation, are accumulating in increasing amounts. I read that the Regional Director for the Southeast Pacific U.S. Environmental Protection Agency (EPA) has expressed his consent to the banning of plastic bags by the Governor of American Samoa, stating “[…] this action will decrease the amount of plastic waste in the territory and directly protect marine and birdlife in the Pacific.” And that this decision “[…] not only helps the local environment, it helps prevent plastic shopping bags from ending up in the Great Pacific Garbage Patch, an enormous area of floating plastic waste”. 2) as a result of their rapid rate of degradation into smaller and smaller pieces, they produce enormous amounts of micro particles, which are inevitably ingested by marine life on a massive scale, and may release toxic compounds that could enter the human foodchain. In the Marine Pollution Bulletin n° 58 from 2009 (pages 1437 - 1446), I read the research conducted by Hideshige Takada of the Laboratory of Organic Geochemistry, Tokyo University of Agriculture&Technology, executed with patterned sampling of floating marine debris of polyethylene PE or polypropylene PP, collected from 14 places, from both beaches (near and far from built-up areas) and offshore, and analyses of these samples with a gas chromatograph. The fragments and pellets of degraded PE and PP, during their extended period of floating on the sea, had absorbed polychlorinated biphenyls PCBs, Polycyclic aromatic hydrocarbons PAHs, Dichlorodiphenyldicholorethylene DDT, as well as Polybrominated diphenil ethers PBDEs, Octylphenol OP, Nonylphenol NP and Bisphenol BPA, in strengths from 1 nanogram per gram to 10 micrograms per gram, that were up to a million times higher compared to those taken from the sea. It is significant to note that PCBs, DDTs and PAHs are chemical compounds which are never used in the chemical industry as additives for polymers, therefore we have to consider they cannot come from the manufacturing process of the original materials of the fragments and the pellets of PE and PP; it is therefore inevitable to infer that those compounds were instead progressively absorbed by the fragments and the pellets of PE and PP during their long permanence in the sea. The NOAA itself, on their website about marine debris mentioned above, affirms in their downloadable PDF document "garbage patch(es)" that "Debris found in these areas can easily be ingested by marine species, causing starvation and other impairments. Additionally, plastic debris act as “sponges,” absorbing organic contaminants such as PCBs (polychlorinated biphenyls). It is possible, though not proven, that plastics could also desorb these contaminants to marine life that ingest plastics." It is true that the fragments and pellets of PE and PP analyzed by Takada’s team did not come from plastic bags, though it is also true that his research admits the possibility that even small fragments of plastic bags, mainly composed of the same PE material, are able to absorb large amounts of toxic compounds in the sea. Embrittled plastic magnified by a microscope. There is another reason which has lead me to believe the ban of non-biodegradable plastic bags to be useful: despite the fact that they are not the only source of environmental and sea pollution, they are currently the only polluting plastic products which can be completely replaced with biodegradable materials, which are safe for the environment. From a strictly technological point of view, the development of new natural polymers would today allow the replacement of synthetic polymers in many applications, as I also read in the paper "biopolymers in packaging", by Professor Francesco Pilati, of the University of Modena, Department of Materials and Environmental Engineering. Biodegradable polymers are those polymers that undergo hydrolytic biodegradation catalyzed by bacteria - there are natural ones, such as polyhydroxyalkanoates PHAs, poly (lactic acid) PLA, cellulose, starch, etc., but there are also completely synthetic ones, such as polycaprolactone and some aliphatic polyesters. For example, Professor Pilati states that polymers based on cornstarch or potato starch represent a family of biodegradable "biopolymers" derived from vegetable products that have mechanical and thermal properties which make them comparable with a wide range of traditional materials. However, I think that the biopolymers currently in use still have a limited use, because the cost is still too high compared to synthetic polymers, at least for those applications where the incidence of the cost of the material is significant to the finished product: in a car, for example, a plastic dashboard is used in lower-cost models, and replacing it with a biopolymer would probably lead to a rise in the cost of the material, making the product un-saleable at current market prices. Instead, for plastic bags, the polyethylene nowadays can be fully replaced by the new biodegradable biopolymers, because the unit price of single-use shopping bags is so low that even doubling it, to repay the higher cost of the production of biopolymers, the cost remains within an acceptable threshold for the market (in Italy the price has changed from EUR 0.04 - 0.06 for plastic bags to EUR 0.10 to 0.15 for bioplastic bags). The alternative use of reusable fabric or synthetic fibre bags, which are not “throwaway”, is also available at a lower cost. Hopefully the prohibition of non-biodegradable plastic bags should dictate the use of products made exclusively from natural polymers, with the exclusion of polymers also called "oxo degradable" or "UV degradable," which are synthetic polymers derived from fossil sources and made degradable with chemicals additives. "The decomposition of organic chemicals by micro organisms with the presence of oxygen, in carbon dioxide, water and minerals of than any other element (mineralization) and new biomass or, in absence of oxygen, in carbon dioxide, methane, minerals and new biomass”. 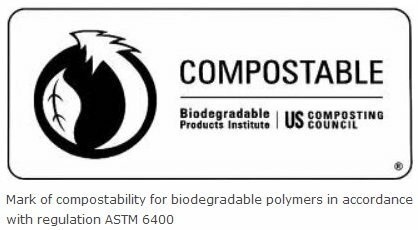 Even in California have been issued two laws (AB 1972 and AB 2071) which forbid to label the plastics bags as "compostable" or "marine degradable" if they don’t respect the regulations ASTM D6400 (similar to EN 13432) and ASTM D7081. - plastics bags have a low unit cost, so even great increases of the price of raw materials would cause a per capita expenditure of no higher than a few dollars per year. So, as stated above, banning plastic bags is not the salvation of the environment, but can be a way to reduce the environmental impact of human activities.